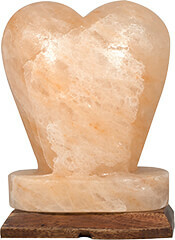 Zennery Himalayan Salt Heart Shaped Lamps are not only visually stunning but provide innumerable health benefits. They are natural negative ion generators. Simply put, salt attracts moisture. The interaction of humid air with the surface of the salt crystal releases negative ions. The negative ions binds to the position ions that are created by electronic devices known as “electronic smog” (computers, television screens, telephones, microwaves, etc.). The positively charged ions lose their damaging characteristics when attracted to the negative ions. Zennery Himalayan Salt Lamps are recommended to improve your environment’s air quality, atmosphere and help promote one’s physical and mental well-being. 6-8 pounds. This lamp plugs into any electrical outlet. Enjoy the benefits of pure essential oils by placing a few drops on the absorbing pad. Safe for travel, performs without heat or water. 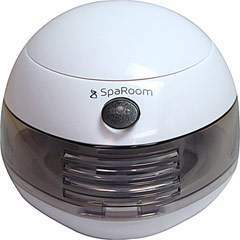 Creates a fragrant and healthy environment with the touch of a button. Powerful and silent fan projects a healthy fragrance with your choice of essential oils. Compact and portable, the Aromafier operates with two AA batteries and a USB connection, allowing you to create a spa experience wherever you go. Create the ultimate spa experience—anytime, anywhere. SpaMist instantly converts normal tap water to a healthy streaming mist with the latest ultrasonic technology. The sleek modern design fits any decor and is simple to use. Just add less than one cup of water and a few drops of your favorite essential oil. Enjoy more than 3 hours of continuous aromatherapy. 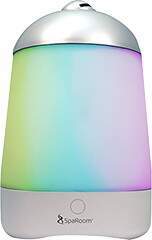 For a pleasant lighting effect, either select the rotating rainbow spectrum or one of the 6 soothing LED colors. Lights may also be completely turned off during the diffusing process. SpaMist completely powers down when the level of water falls below the minimum fill line. Cleaning is easy, just wipe wipe the inside out with a soft cloth before duplicating the above process. Use with Aromappeal Essential Oils for natural benefits.